In 1871 the children‘s book “Through the Looking-Glass – And What Alice Found There” by the English author Lewis Carroll, in which Alice enters a world behind the mirror, was published. She explains to her cat: “First there’s the room you can see through the glass – that’s just the same as our drawing room, only the things go the other way. …How would you like to live in Looking-glass House, Kitty? I wonder if they’d give you milk in there? Perhaps Looking-glass milk isn’t good to drink!” ­Even if Carroll did not know the effect of mirror-image compounds, nevertheless, it seems likely that mirror milk would actually be different, due to the molecular structure. There are molecules that resemble each other like the left and right hand of a person, i.e. with the same elemental composition and bonding of atoms, but they differ from one another in the spatial arrangement of the substituents, such as image and mirror-image. Such molecules are called enantiomers, they are chiral (Greek cheir = hand; χερι). 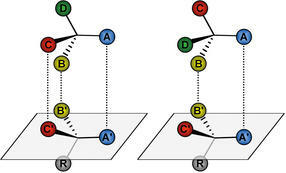 Molecules with the same type of linkage but with a different spatial arrangement of the atoms, which do not have an image/mirror-image relationship with each other, are called diastereomers. These may or may not be chiral. Chiral molecules have different effects, they can taste or smell differently or have different pharmacological activity. 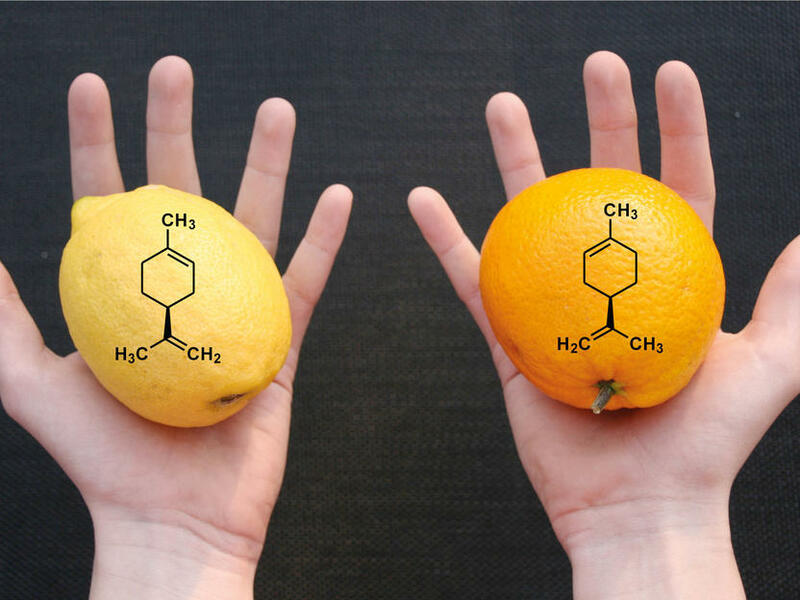 Thus, the (R)-limonene smells like orange, while the mirror image (S)-limonene smells of lemons (Fig. 1). Another example is (S)-carvone, which smells like caraway seeds, and the smell of the enantiomer (R)-carvone, which is like spearmint. Thus, in a mirror-image world things would be very different, for example, we could not recognise things by their smell or sugars would lose their sweetness. Therefore it would not be surprising if looking-glass milk really did taste different. Fig. 1 Oranges contain (R)-limonene, lemons contain the mirror-image (S)-limonene. With regard to drugs that are “designed to cure or alleviate or prevent human or animal diseases or pathological symptoms”, as defined by the German Drug Law, the impact can be much more dramatic. The two enantiomers of a drug may differ in their potency or even have opposite (even toxic) effects. An example of the different potency of enantiomers can be found in the β-blocker propranolol, whose (S)-enantiomer has a 100-fold stronger antagonistic activity at the β-receptor than the (R)-enantiomer. In contrast, while (S)-penicillamine is used to treat Wilson‘s disease or as a therapeutic agent for rheumatism, the (R)-enantiomer is highly toxic. This is not surprising, since all of the specific interaction partners of biologically active substances (i.e. receptors, enzymes, nucleic acids, etc.) are made up from pure enantiomer building blocks (amino acids, sugars, etc.) and thus are also chiral. The chemical synthesis often leads to 1:1 mixtures of enantiomers, so-called racemates. Due to possible different effects, the regulatory authorities such as the U.S. Food and Drug Administration (FDA) and the European Medicines Agency (EMA) today require the study of the individual stereoisomers of a drug and then, where appropriate, the development of the active enan­tiomer. This requires not only the appropriate synthesis methods but also analysis methods, which are able to discriminate between the enantiomers. Stereoselective analysis is not only important for the pharmaceutical industry, but also affects many other areas of analysis of chemicals, cosmetics, foods, biological materials or environmental samples. The “classical” analytical procedure for enantiomers is polarimetry, where the rotation of the polarisation plane of linearly polarised light is determined as it passes through the solution of the substance. The process is, however, characterised by low precision, high interference and high substance consumption. 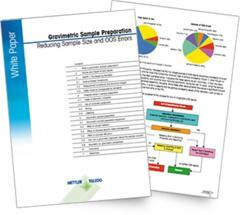 Modern methods for enantiomer analysis are chromatography and capillary electrophoresis. Here, the interaction is between the analytes and a chiral selector, which is also a chiral compound. To illustrate the procedure the three-point interaction model (Fig. 2) is often used, which despite several flaws, provides a clear explanation. Only one enantiomer can have three interactions with the selector; due to the spatial arrangement, the other enantiomer can only have two interactions. It is readily apparent that the complexes differ in their stability, so that ultimately there is a separation of the enantiomers. Fig. 2 Three-point interaction model. 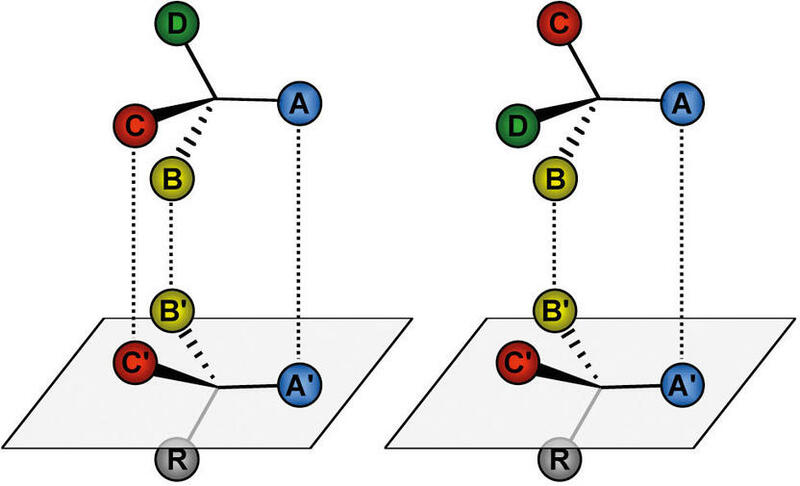 The left enantiomer can ideally form 3 interactions with the chiral selector, the right enantiomer only 2. In chromatography, the chiral selector is bound to a stationary phase, in capillary electrophoresis it is added to the background electrolyte; this is called a pseudo-stationary phase, since the selector is mobile. The principle of chiral recognition of enantiomers in capillary electrophoresis and chromatography is the same, even if the transport of substances to the detector proceeds in a different manner, by using pressure in chromatography or using electrokinetic phenomena in capillary electrophoresis. Important chiral selectors used in capillary electrophoresis are cyclodextrins, macrocyclic antibiotics such as vancomycin or teicoplanin, chiral crown ethers, metal complexes, proteins or chiral micelles. Due to their availability, cyclodextrins are the most commonly used chiral selectors. These are cyclic oligosaccharides derived from the microbiological degradation of starch. The frequently used α-, β-, and γ-cyclodextrins consist of 5, 6 or 7 α(1,4) linked D-glucopyranose units. They are shaped like a torus with a lipophilic cavity and a hydrophilic exterior surface. The interaction with analytes occurs via formation of inclusion complexes due to hydrophobic interactions in the lipophilic cavity or by interaction with the OH groups. By derivatisation of the primary and secondary hydroxy groups, numerous substituted cyclodextrins with modified complexation characteristics can be produced, which can be used in numerous separation modes. Fig. 3 Formula of β-cyclodextrin (A) and the molecular modelling view of the complexes between β-cyclodextrin and the dipeptide L-alanyl-L-tyrosine (B). Besides applications in the chemical industry, in food or environmental samples, enantiomers play a particularly important role in pharmaceutical analysis. One reason is the different effects of enantiomers of chiral drugs already mentioned. Following international guidelines, the “wrong” enantiomer should be detectable at one-thousandth of the quantity of the “right” enantiomer, ­i.e. have a maximum content of 0.1 %. 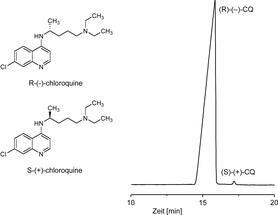 This has been demonstrated for many drugs (see the example of the antimalarial drug chloroquine in Fig. 4). Another important direction of work is the study of the enantioselective metabolism of drugs by the human body. Since the metabolising enzymes are also chiral, a particular metabolite frequently arises preferentially from one enantiomer, while the other enantiomer can be converted to a different metabolite. In addition, people differ in the activity of the metabolizing enzymes, so that drug effects and side effects can also be a consequence of stereoselective metabolism. As a method that requires only small sample volumes, here capillary electrophoresis also makes important contributions. Fig. 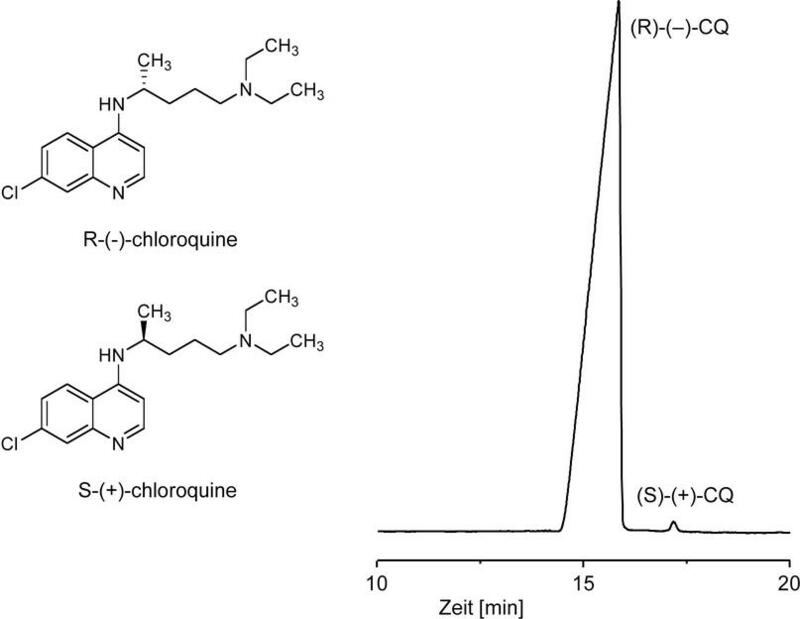 4 Analysis using capillary electrophoresis of a sample of the (R)-enantiomer of chloroquine containing 0.2% of the (S)-enantiomer. 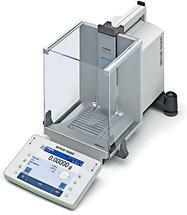 Experimental conditions: fused-silica capillary, effective length 40 cm, 50 μm internal diameter; background electrolyte: 100 mM sodium phosphate buffer, pH 2.5 with 30 mg/mL sulphobutylether-β-cyclodextrin; voltage 25 kV; temperature 20 °C; detection wavelength: 225 nm. Some 30 years after its introduction, capillary electrophoresis has developed into a mature, flexible analysis method that is ideally suited to enantiomer analysis and is established in many areas. For the miniaturised procedure only small amounts of sample and chemicals are needed, organic solvents are hardly used. Capillary electrophoresis is therefore a cost-saving and environmentally friendly method of analysis. Future developments lie in a further miniaturisation of the process using chips that allow the integration of different analysis steps (keyword “lab-on-a-chip”). First publication: Scriba, G. K. E., q&more, 2.2011.